While this year’s been an anomaly, typically when March rolls around people are pretty antsy; it’s not quite spring and winter seems to be dragging on. It’s usually at this point that parents are looking for something to do, anything really, with their kids. And, inevitably, growing up, we would find ourselves piling in the station wagon taking a little excursion to the Maple Sugar Farm in South Natick (however, I believe, it’s really named the Natick Community Farm). And, that’s the flashback I had, which, by the by, made me chuckle, as I opened an email at work touting the NY Maple Weekend. May seem like an odd email to get at work, but being in the travel industry I do receive all kinds of newsletters with little tid bits about where to go, what to do, etc. 17th Annual NY Maple Weekend (March 17, 18, 24, and 25): Producing approximately 565,000 gallons of maple syrup in 2011, the highest production rate in 64 years, the New York State Maple Producers Association’s Maple Weekend is chuck full of demonstrations – from boiling sap over an open fire or running it through highly scientific equipment — and family-friendly events. 11th Annual Vermont Maple Open House Weekend (March 24 – 25, 2012): The largest producer of maple syrup in the US, producing 890,000 gallons of syrup in 2010, the Vermont Maple Open House Weekend is held at sugarhouses throughout the state. 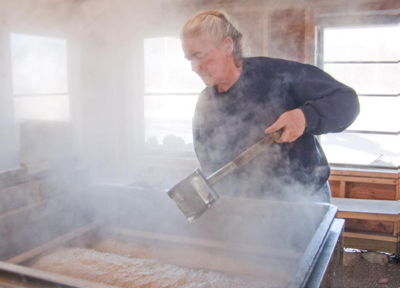 The weekend is the public celebration of the state’s maple season and a chance for folks to visit sugarhouses throughout the state to learn about Vermont’s first agricultural crop of the year. Activities during this free event will be different at each sugarhouse but will include the opportunity to watch maple syrup being made (weather permitting) and to often sample syrup and other maple products. 46th Annual Vermont Maple Festival (April 27 – 29, 2012): Held in downtown St. Albans, this celebration is a nod to the end of the maple season in Vermont. Attractions include an Exhibit Hall, a Fiddlers’ Variety Show, Sugar House Tours, Pancake Breakfasts, a Sap Run Road Race, Cooking Demonstrations & Contests, a Giant Parade, Maple Creemees, Maple Sugar-on-Snow, and Maple Cotton Candy. New Hampshire Maple Weekend (March 24 – 25, 2012): An annual open house held by the approximately 100 sugarhouses throughout New Hampshire, the weekend showcases the maple syrup producers’ amber-colored liquid jewel and the products made from it. Various houses will be offering samples of syrup, maple products and refreshments, some complete with petting farms, pancake breakfasts and other family friendly activities. 65th Annual Pennsylvania Maple Festival (March 24 – April 1, 2012): Held in Meyersdale, the first festival was held more than 60 years ago. Events include Pancake breakfasts and dinners, a quilt show, the crowning of the Maple Queen and, even, tea with the Queen for the little ones. While we didn’t see any tapping into Maple trees, last weekend was spent in Pennsylvania. As we entered our friend’s house, I envisioned a scene from the ‘hot air club.’ Greetings were made and there was a sudden flurry of activity as everyone shifted spots to make way for the perpetually late Tony and Paula (the big man takes all the heat for that one, as I, being German, personally am just too uptight to continually show up places late – the Stifter clan can stop laughing now). While there, we had a wonderful dinner which was topped off with an amazing selection of desserts, one of which was an absolutely delectable pecan pie, bought at a local shop, The Village Farmer & Bakery. If you’re ever in the Delaware Water Gap area, it’s definitely worth the stop. 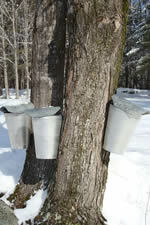 If you check out any of the Maple Syrup festivities, let me know, I’d love to share your findings with others. In the interim, the Vermont Maple Syrup organization has a great site with lots of Maple Syrup recipes, above and beyond pancake syrup, you can try at home.